So you’ve laid the track and have your trains running merrily around. Great work! Brunel and Stephenson would be proud. But now what? 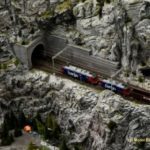 How do you make that collection of track and trains look like a miniature world. This is the article I’ve been itching to write since I started this blog. And, It’s taken five years of writing MRE and 10 times that long building model railways and diorama’s before I felt I could do it justice. The result one of the most comprehensive, detailed and, at over 4,800 words, the longest articles I’ve written here. It’s actually longer than some of the low-quality model railway eBooks that pop up around the web! 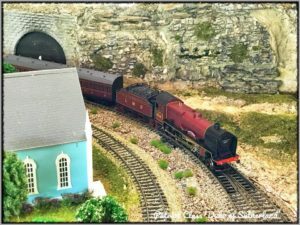 All the main landscape features you could want on your layout are covered here, along with numerous tips and advice that I’ve picked up and learned over the years and from the Model Railway Engineer community and gurus across the Internet. We’ll start from the ground up, literally. 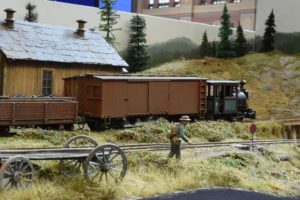 Most model railways often start on flat boards of some variety: tables, door frames or even decorating tables are all common. And it’s a great way to start and get a feel for the hobby but before long we get a niggle to do bigger things. To add a vertical dimension to our layouts, to work in three dimensions. So how do you go from flat landscape to one that rises and falls, a layout that sinks and rises around the track? Making the wooden foundation for hills and mountains, from Miniature Landscape Modelling by John Ahern. The original approach to creating landscapes, as those who built railways in the 50s and 60s and now returning to the hobby might remember, was to create open timber frame with strips of wood between the structs to make the principal contours of the land, seen right. (This drawing is from one of my early landscape bibles ‘Miniature Landscape Modelling’ by the creator of the famous Madder Valey layout, John Ahern. My copy is now pretty tattered from use and it’s sadly hard to come by now but if you can get your hands on a copy it’s well worth it). With the contour formers placed, chicken wire is secured over them to fill in the gaps and onto which plaster cloth is laid to provide a surface. A cardboard matrix for hill construction ready to be glued to its wooden framework. Personally, cutting chicken wire to fit isn’t my idea of fun and my fingers have suffered enough cuts from doing it that I won’t be doing it again any time soon. When I did use open-frame boards and formers, I preferred placing cardboard matrices between the formers. These are nothing more than strips of cardboard laid across each other to create a grid and which is then glued to the wood. They’re a great deal more finger friendly than cutting and bending chicken wire although admittedly they don’t hold their shape as well as the metal of chicken wire when bent. As with chicken wire, plaster cloth is laid over the top to provide the surface layer. Plaster cloth can be purchased online, from most model shops, or made at home from old t-shirts if you’re so inclined. 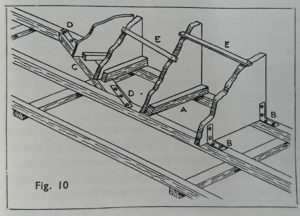 Finally, wood strips are placed in and between the vertical ‘formers’ to provide the base for the track achieving the desired result of a landscape that rises and falls above and below track level (as seen in the illustration here from Landscape Modelling by Barry Norman which explains the technique in more detail. 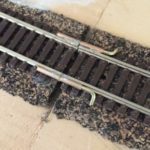 This results in a very lightweight baseboard and is arguably the best approach if you are creating a landscape with a wide variation of height or where the ground frequently falls below the rails. But what if you don’t have the means to make an open frame baseboard and have already started with a flat surface on which you want to build? You can either grab a chisel and start carving or add a layer of other material on to which the rails can be mounted but which can be more easily cut and shaped. The ideal material for this is foam insulation padding sheets, available from DIY stores. Alternatively, the polystyrene sheets used to protect just about every delivery can also be used. Either way, they provide an ideal raised based into which hollows, valleys and other features of a landscape that, as John de Frayssinet says, “sink below the rails” can be easily cut. Extra: Yet another alternative, is to do away with the wooden foundation completely and build the layout on just foam insulation. This provides easily the lightest weight option and when placed in a timber outer frame gives surprisingly strong, certainly more than en0ugh for a railway. If you’re just starting out, I’d certainly recommend this alternative baseboard approach. Using this as a base also has the benefit that trees and other vertical objects — lamp posts etc — can be just pushed into place rather than having to drill holes or hold them in place while glue sets. To fix it to an existing wooden base is a simple matter of slapping on some white wood glue (PVA) and weighing down the foam while the glue sets. I would suggest mixing the glue with water and spraying it over the wood surface several times instead of just pouring or brushing it on. Once the glue is dry and you have a foam surface to work on, carving and shaping is done using a variety of tools. Between you and me, is one of the aspects of the hobby I most enjoy and find very strangely relaxing! Sure, it’s messy but there’s something very fulfilling about hacking away at foam creating the landscape I desire. It’s also easy to correct when mistakes are made (as I do all frequently) — just cut another piece and glue on or over the delinquent shape. For cutting, a simple kitchen knife is common although the messiest. Alternatively, a hot knife or foam cutter can be used. These are the fastest and easiest although should only be employed in well-ventilated areas as the fumes from burning foam is horribly toxic. This stuff isn’t like the sometimes pleasant smell of glue or paint (or is that just me? ), it’s really nasty stuff and shouldn’t definitely only be done wearing a mask and/or outdoors. The smoke can also discolour walls and ceilings, as I’ve learned to my cost. If you’re happy to take risks, one of the most fun although potentially dangerous methods, is to use a naked flame, as demonstrated here below. I just love the natural, organic, look this creates. Perhaps one of the most sought after features on model railways are water features. Before getting to creating the water itself — covered next — you’ll need to make the river or lake bed. Mark out the shape of the pond, lake or path of your river and then carve it out of your baseboard as described above using a sharp knife, hot knife in the case of foam or using with a chisel if you have a wood baseboard. If you’ve used an open frame baseboard, it’ll just be a case of forming the river bed with plaster cloth between adjacent wood formers. Always have good quality photos of rivers and lakes to work from as a reference (Google Images is an endless resource for these if you haven’t got your own) and pay attention to bends and curves. Unless man-made they will almost never be sharp angles but gentle, where the water has eroded the ground over time. 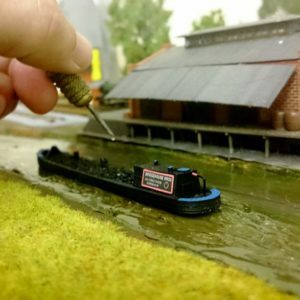 A small stream on my layout, created with nothing more than PVA and varnish. Once the bed is carved out, use clay or plaster to shape the river banks and then paint the river bed and sides with a rivery colour, that’s the technical name!  This is usually green/brown for slow-moving rivers and sandy brown or grey for faster moving waterways. Why the different colours? It’s obvious when you think about it. As Tristan Gooley discusses in How to Read Water (recommended if you want to understand rivers and lakes to model them more accurately), in fast-moving currents vegetation is washed away before it has the chance to grow. In such rivers, weeds etc won’t grow so you’ll see the base rock colour – sand or grey rock. In slow moving water, however, plants will find a footing and grow so the river bed will be greenish. For depth, darken your chosen colour. It’s usually the case, that the deepest part of the river is the centre so a dark strip down the middle of the river bed looks good. One tip I would suggest is to let the paint set but before it dries fully dab the bristles an old brush around the paint so as to blur the edges and remove streaks (mud, weeds and silt in rivers don’t have hard defined edges as left by a paintbrush). 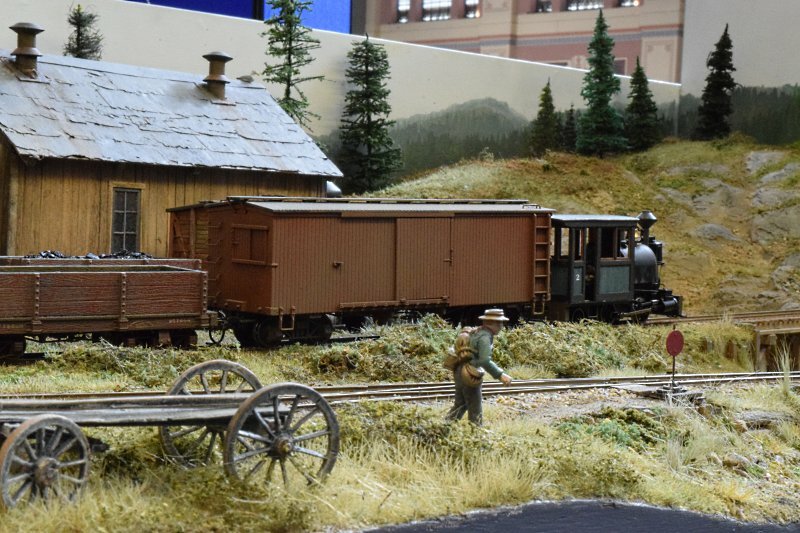 For slow moving water, you can ‘splash’ the cash and buy Woodland Scenics Realistic Water. This is just poured into place and left to dry. It looks good and is quick but costs quite a lot. (Extra tip: Unlike paints, you don’t need to shake this before use. In fact, make sure you don’t. This creates bubbles in the mixture that will remain as it settles and spoils the look). If this doesn’t appeal, there’s a budget alternative. This being a combination of good old PVA wood glue and varnish. 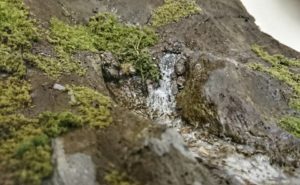 It’s cheap and if used correctly can create just as good a river or stream as the Woodland Scenics material, it just takes a lot longer. The key, and time-consuming aspect is to apply the glue in layers. Pour it into your river basin to a few milli-meters deep and let it dry completely. Repeat this until you have the depth required but make sure you let each layer dry before applying the next. I also apply streaks of green and brown paint to some layers, after they’ve dried, to create an impression of depth and movement but this is optional. Once the glue is fully dried, paint on varnish to give the water surface the sheen that water typically has. 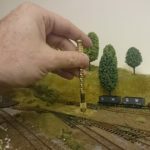 You can also use a pencil tip or other round ended implement and gently move it through the varnish as is settling to create ripples as seen in one of my N gauge rivers pictured above. The alternative and particularly effective for fast moving water or where you want waves and lots of ripples again uses wood glue but with an added ingredient. I first learned it from Martin Tärnrot and it produces beautiful results very cheaply. First, put down a coat of wood glue. Onto this put sheets of bathroom tissue or think kitchen paper towel and the paint on more glue. With plenty of glue on the paper, take a largish paint brush and poke the bristles into the glue to create. A choppy stipple effect. Next up, paint the surface with a variety of greens and browns and then add several more layers of glue, letting each dry before moving onto the next coat. Then add several coats of varnish. Martin recommends water-based varnish and the type I use for protecting and painting my baseboards seems to work well. You can add ballast to simulate rocks and small stones – depending on the size of the ballast. If you do this, however, pay attention to where in the river you place them. As Tristan Gooley explains in How to Read Water, the size of the rocks found is dependent on the speed of the water. Fast moving currents will move larger rocks and bolders. As the river slows, slow down you’ll find smaller stones – especially in the Lee of larger holders when the current slows and the stones. For waterfalls, take some clingfilm and scrunch it up. On to this pour a small amount of PVA and wait until it becomes tacky but still pliable. Now with the round end of a paintbrush draw channels along its length. Alternatively, you can use Woodland Scenics Water Effects, drawing stips along the waterfall. In both techniques, you want gaps between the ripples. When dry, highlight the top of the waves and ripples with white enamel glue. Once done, glue the cling film over the vertical area where you want the waterfall. For white water at the foot of the waterfall, pour PVA and let it set until tacky. Now use the stiff bristles of an old brush to stir. You can see the result of these techniques in the waterfall on one of my layouts above. This video by Martin explains both white water and waterfall techniques in more detail. The end result is water you’ll be proud of. A video tutorial of this and other techniques is in my article on modelling water. For static water, the technique is very similar. Create the recess for the lake as described above; create the banks with clays; paint the lake bed and sides and then pour in layers of PVA white glue and top with varnish. For the deepest parts, use a darker colour paint on the water bed (remembering to dapple the edges of the area being painted to remove hard edges) and vary the colours to create subtle blends and shades. (Again, using photos of real lakes for reference). Did you know? Lough Neagh is the largest water body in the UK, although Loch Ness is the largest by volume and contains nearly double the amount of water in all the lakes of England and Wales combined, Loch Morar is the deepest of the UK’s lakes and Loch Awe the longest. As finishing touches, add vegetation along the water line. It’s often the case, that plants along the water-edge, benefiting from the water, are greener and richer in colour than those further away. 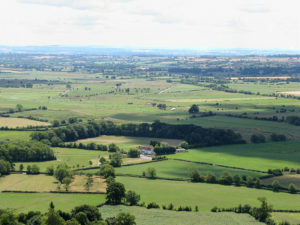 While hills are formed by erosion and sediment deposit, flat landscapes are the opposite; land that varies little in height, such as the Somerset Levels pictured here. These are remarkably easy and cheap to make and model. It’s literally a case of taking a designated area, laying strips of plaster cloth over it, painting dark brown and green and then and covered with vegetation: scatter, static grass or clump vegetation and bushes as above. (The plaster cloth layer adds a degree of unevenness the fields and flatlands). If modelling English fields bushes and hedgerows are particularly important as they are used as boundary points and demarcation between fields and pasture land. For increased realism, some sections can be decorated in different colours to hint at different vegetation and crop rotation cycles in the case of farmland. Trees should also be added. I’ve written about making these before (the most common way of making trees) and will cover forests in detail below but the quickest and cheapest tree making technique is to use some twiggs for the trunk and add some sponge painted green and topped with scatter as I’ve written about before. This gives surprisingly good results for trees with dense canopies. I find this gives really good results and best of all you can create a variety of different sizes trees from a typical batch of seafoam. 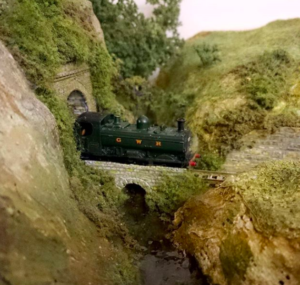 Large regions of forest land aren’t commonly seen on UK model railways which is a shame as they can look spectacular and are relatively easy to make. 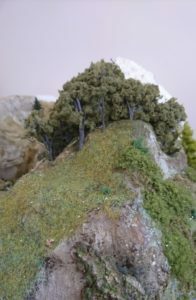 My preferred technique for making forests is to cover an area in expanded foam, let this dry, paint with a mix of browns and then top with very short static grass for HO / OO scale or scatter for N scale. The uneven expansion of the expanding foam creates the perfect form for a treetop canopy. To finish off, take some Twiggs and place at the front and then place some normal trees in front of this. This creates the impression of depth when looking from the front. This technique, as can be seen right, creates convincing deep forests quickly and without the cost of buying or making lots of individual trees. Thanks to John de Frayssinet and his book Scenic Modelling for the tip. With the shape of the below rails terrain in place you can now work on specific aspects that rise out of and above the landscape. 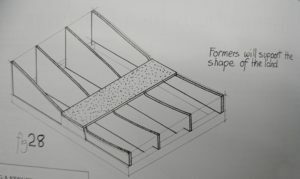 Unless you build your hills from wooden formers to the open frame construction technique I’ve already covered, hills are usually built up from base material using some form of stacking material and then covered over to create gentle sides. Extra: Why Smooth Hill Sides? Hills and hillocks are formed by the erosion and weathering down of larger landforms such as mountains, and the deposit of sediment by glaciers. As such, they typically have smooth, gentle, slopes whereas mountains (created by more violent movement of tectonic plates and volcanic eruptions ) are sharper, steeper and more vertical. So when making your hills keep them smooth and gentle. 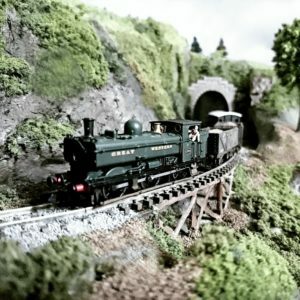 When I built my first model railways a “few” years ago I used sheet-after-sheet of crumpled newspaper and then covered them with sheets of the paper soaked in a glue-water mix. It was messy and TBH, not that good but through my younger eyes it looked good. I cut and shape wedges of the foam with a hot foam cutter, glue bits together and then top with fine plaster or Hydrocal, which is a combination of Plaster of Paris and cement and sold under various brand names. I recommend fine plaster over normal builders plaster as it gives a smoother finish which is easier to subsequently paint on. The application is just a matter or slapping it onto the Polystyrene and shaping it. If, like me, you were the sort who delighted in playing with mud as a kid slapping on plaster and pushing and sliding it around with your fingers to get the desired shape and form this is paradise. Alternatively, a spatchula borrowed from the cutlery drawer or even dedicated model and painting knife set can make things a lot easier. This is the technique that I’m now sticking with. It’s cheap but also gives the best looking results yet doesn’t weigh a lot. When dry, apply dark Acrylic-paints, kids watercolour paints will also be fine. I typically use mixes of Winsor & Newton Burnt Umber, Raw Umber, Mixing White and Yellow Iron Oxide depending on the rock and ground colour I want. To this, you can now add a scatter material or static grass to create surface texture and ground cover. Scatter can be made from crushed leaves while teddy bear fur makes good static grass. For bushes and hedges bits of old sponge painted different shades of green and topped with scatter can look very effective although rubberised horsehair covered with very fine scatter is hard to beat. You may find that you don’t have the space to create a hill scene of the size it would be if you were following scale sizing rules to the letter. 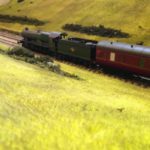 A 500ft hill would be 5ft tall on a Hornby OO gauge layout for example. The answer is compression; selective reduction of landscape features, structures, and track so they fit into your available space. This is beyond the shrinking involved in simply scaling it down to the proportions of OO, N scale etc. It is usually achieved by selectively removing parts or aspects of a structure. In the case of hills, this is a case of reducing the dimensions but doing so in a way that is faithful and looks realistic. A stunning rock face created by Rodney Draper using Woodland Scenics rock moulds and Earth Colours liquid pigments. Sometime, you’ll want hills with rocky outcrops or exposed rock faces and cliffs. They look great on a layout but can difficult to get right. I’m certainly still perfecting my techniques for them. They can either be done using pre-made moulds such as those by Woodland Scenics or made using a variety of DIY techniques. Although impressive results can be achieved using pre-made moulds, see the photo of the wonderful rock faces created by Rodney Draper as an example, there are problems with them. As Tony Hill remarks in Realistic Landscapes for Model Railway, “plastic moulds tend to be too repetitive and although they offer different shapes and sizes, they will only be of one rock type; they will need a lot of work to make them convincing for, say, a limestone face”. Tony’s technique and one I now use is to coat the underlying terrain in thinned PVA and then spread plaster mix over the surface. Unlike hills, rock faces need a rough, rugged, finish for which the gentle finish of finger shaping through the plaster won’t do, so the knives in the previously suggested set are best used. These are drawn across through the plaster to create the strata. Tony suggests dipping the knife into clean water to help make the plaster more workable. (For slate, flatten the surface of the plaster and then drag the edge vertically down the face). Finally, leave to dry before brushing with an old toothbrush to remove any unwanted surface blobs that might have built up while dragging the knife. To this I would only add, that I always try to have a photo of an actual rock face from the area being recreated and use this for reference when dragging the knife, watching the width of the strata lines etc. An alternative technique, used by many members of the MRE community is to scrunch up Aluminum foil (tin foil) and use it as a mould as explained in the video below. No matter which technique you use to create the rock texture, for painting I apply a dark acrylic wash (paint heavily diluted with either water or acrylic thinner) that will darken the recesses and cracks then paint on the desired colours before finishing with a light dry brush for highlights. As with all modelling, always have reference photos to hand to match the rock colours. For a Quartz look, small speckles of Grey, can be achieved grinding white pastels over the rocks from several inches above so they space out as they fall. Another, and my preferred approach is to dip a toothbrush into some white paint, rub it on cloth or newspaper to remove most of the paint and then flicking the bristles over the rocks. I owe this latter technique to David Neat, covered in his comprehensive guide Model Making: Materials and Methods. Finally, if appropriate, finish off with scree (fallen rocks) and small vegetation such as climbing plants is added. The best tip I’ve yet found for making scree is by again John de Frayssinet who recommends using Polyfilla. He simply mixes a batch of Polyfilla and lets it set piece of plywood. “Judicious use of a hammer” produces the rubble, which is then coloured by dropped the peices into a pot of dilute base coat, retrieved and left to dry. The fallen rock and vegetation is then positioned and fixed into place with PVA – remembering to use good quality photos of cliffs and rocks as a reference to work from. Okay, I know tunnels aren’t a landscape feature as such but they’re so much fun to have and create curiosity for the viewer. Making the tunnel is straightforward. Just build a hill (as above) but during construction leave a gap through it for the track and then cover it. If you want it to look really good, you can also use brick paper to line the sides of the tunnel walls to add extra realism to your layout as I’ve explained before. Easy right. What could go wrong? You’d be surprised. For starters, you need to ensure the gap inside the hill is wide and tall enough for all your trains. Please don’t, for your sake, just guess this. Luckily, there are defined standards you can work that describe exactly how tall and wide the gap needs to be. These are known as the loading gauge and. 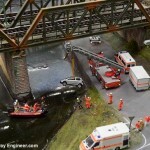 For OO gauge, N gauge and the main other model train sizes these are detailed here. Make sure your tunnel complies with these. This scene shows the hill and rock techniques covered; the tree top line is made using the forest technique and also hides access to a tunnel inside the hill in case a train ever derails. Just as importantly is giving yourself access to the trains and track in the tunnel. Getting a train stuck deep inside a hill if you haven’t engineered a way to get at it is not fun. A common solution is to have an access way at the rear of the hill out of sight. Alternatively, the hill can construct it so the section of the hill can be lifted off. The difficult part of this is then disguising gap where the lift-off section meets the rest of the scenery. Most commonly, the join is hidden by placing something in front of it — a row of trees in the case of my hill seen on the right, fences or bushes are also being common. 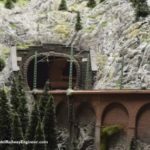 With the tunnel itself constructed, add a tunnel portal to the entrances and exits. Plastic kits of these are made by Ratio, Vollmer and Faller. Make sure however the top of the hill doesn’t end at the same height as the top of the portal, the hill should continue to climb above the brick and stonework. If the hill is near train height or just above it, engineer’s would most likely have avoided the difficulty of tunnelling and just blasted through it and created a cutting. I love writing articles like this because, aside from helping others by sharing all these tips, I always learn something new while researching and trying out the tips featured. In the case of this one, I found a new way of painting Quartz rocks (thanks to David Neat) but there’s always more to learn and techniques to try. 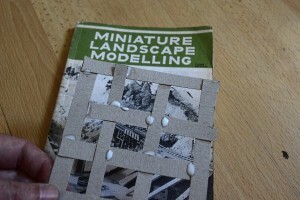 If this guide to making scenery has whetted your appetite and you want to have a go at making your own hills, rivers, lakes, and tunnels I recommend the following books and then let me know what techniques work for you. I’ll be happy to share any Perls of wisdom with everyone else here. 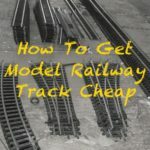 Modelling Railway Scenery: Volume 1 by Anthony Reeves. Photo credit: Top, The perfectly modelled Clearwater Harbor by Steve Waterfield.